One observation, I noticed is the grain on the cabinet. Just about every Amberola 30 had plain Oak. Yours is Quartersawn Oak. The more expensive Amberolas, like the 50 and 75, used that higher grain of wood. I wonder if Edison have a supply of left over Quartersawn Oak, and nickel plated mandrels. Sure is interesting. I can't quite make out the form no. of the Cabinet factory no. tag on your 30's bottom. Could you please tell me what it is? I'll get that tomorrow, Fran. Sorry. I had 2 close ups of the tag but neither one shows the Form clearly. I noticed is the grain on the cabinet. Just about every Amberola 30 had plain Oak. Yours is Quartersawn Oak. The more expensive Amberolas, like the 50 and 75, used that higher grain of wood. I wonder if Edison have a supply of left over Quartersawn Oak, and nickel plated mandrels. Sure is interesting. Thanks for your comments, Harvey. I hadn't even thought about the wood grain being different relative to most other Amberola 30's. Good observation! Last edited by VanEpsFan1914 on Tue Jan 29, 2019 8:49 pm, edited 1 time in total. I love Amberola 30s and this thread is eye candy for me! That would be cool if the machine discussed is the same one out of that old photograph. As the caretaker of Amberola 30 #229834, I must confess that the machine I own, while later, is not at all "original." It has a TrueTone diaphragm, a Rutkowski grill, silk speaker cloth, a new bottom sourced from a junked machine out in Arizona (yes, the correct one, not an old first-gen model) and, of course, fresh veneer sourced, applied, and also sold on the aftermarket by Yours Truly. Hint Hint! Notice on these two late machines that the data tag reads, "Thomas A. Edison Inc." rather than "National Phonograph Company." 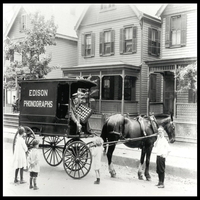 Edison only started calling his company that in 1924 if memory serves. #229834 was discarded in a Florida Goodwill with a 1913 recording of the "Horse Trot" stuck on the mandrel. It had been dropped and the molding damaged on the front corner of the machine. Also, roaches had taken up residence and their filth was pouring out of every corner and cranny on it. It looked like it was ready for the parts pile. I took a can of sewing machine oil and twenty minutes later it roared back to life. Amberolas are great! Mine is very standard. The mandrel and bedplate supports are all standard issue Amberola parts. Unlike the anomaly that started this thread, my veneer was riftsawn oak rather than the beautiful quartersawn used on the unique example. Here you go, some pics of a super-late Amberola 30. You probably won't find any Amberola 30s marked "National Phonograph Company" since it was absorbed into Thomas A. Edison Inc. in 1911. What if that’s the exact same machine as shown in the photo that Fran shared??? Here's a better picture of the cabinet (underside) tag as promised, Fran. The 'Form' number is a bit worn on the tag but it looks to me like it reads 'Form 890' or 'Form 390'. Hope this helps! Thank you much, Doug, that would be "890". I've (loosely) observed that factory number most used for the various factories. Hopefully oneday one of us will be able to "crack the code", and be able to identify which manufacturer corresponds to specific number codes. Hopefully oneday one of us will be able to "crack the code", and be able to identify which manufacturer corresponds to specific number codes. I'm nearly positive that Factory No.18 was Edison's own New London, Wisconsin facility. I base this on very late examples of various machines, which seem to be nearly all from No.18. In the mid-late 1920s when production had been scaled back significantly, cabinet subcontracting seemed to end in favor of in-house production.